Dabur Baby Olive Oil Extra�nourishing�baby massage oil. Skin texture, Moisturizes soft skin, Nourishment to babies. Dabur - Baby Care Product - Worldwide Shipping. 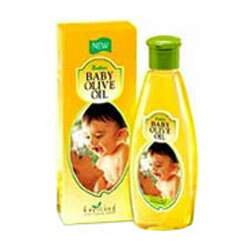 Dabur Baby Olive Oil is a mild and extra nourishing oil specially formulated for baby massage. It contains pure "Extra Virgin Olive Oil enriched with the choicest natural herbs like Sandal, Almonds, Basil and Neem. Making the oil massage even more nourishing and healthy for your baby. Apply during massage for babies up to 2 years a baby massage oil used for providing nourishment to babies.